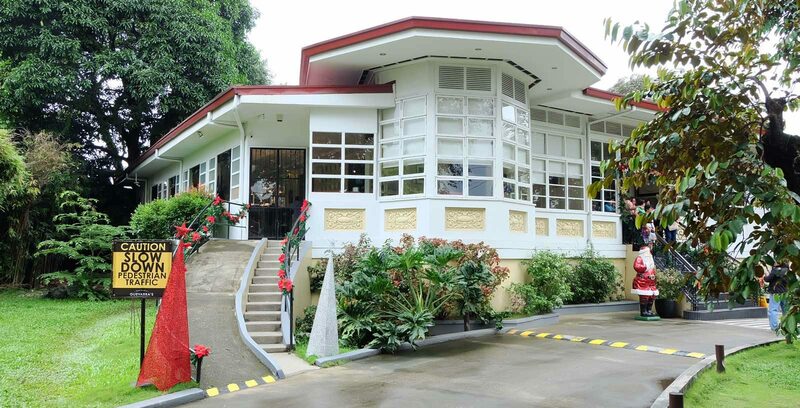 ‘Tis the season to be eating and Guevarra’s serves up a Yuletide feast fit for a king starting today! You read it right, TODAY, October 15! Christmas comes early at Guevarra’s. For those who have sampled Chef Lau’s popular buffet you already know that a regular 3 hour reservation for lunch, merienda, or dinner is not enough to taste all 80 dishes they regularly serve. For the Yuletide season they’ve added 11 new dishes. This means we can enjoy 99. OMG,NINETY NINE DISHES! How can we taste/eat them all? Chef Lau and Chef Jac sat down one day and thought about what dishes are traditionally served at Filipino get togethers like Christmas gatherings and reunions. In a previous post I featured the eleven Yuletide dishes they added to the menu. I’m not a big fan of liver but I did try this pate and it was good. Smooth and creamy. The name, though, was a tad confusing. It’s a pate but it’s called a parfait? Like the ice cream? All we need are cooked macaroni, cream or mayonnaise, cheese, raisins, and gelatin. The kids like to cut the gelatin into different shapes but cubes will suffice. The red and green gelatin cubes makes this favorite holiday salad colorfully beautiful. Two dishes in one! Lasagna noodles are just perfect for this dish as it acts as both the wrapper and the pasta dish. 😀 During the blogger event Chef Lau shows us how they made this dish. Lucky us! Watch the video as he demonstrates how to make it step by step. And for those of us who like to cook this means I could try to make this myself for noche buena. Actually, I definitely will make this for noche buena. 🙂 I hope I can do it justice. Beef morcon is also a staple fiesta dish at home. Our Yuletide festivities is just not complete if there is no beef morcon on the table. It almost isn’t a good idea to eat paella at a buffet. Why? because paella is a mix of rice and viand all cooked at the same time — meaning, it is already a buffet in itself! Some people say that turkey is just a big chicken but one taste will prove otherwise. Paired with gravy or cranberry sauce, my favorite part is the thigh. Cooked improperly turkey could become dry and tasteless. But never at Guevarra’s. This stuffed turkey is just delicious! Pudding is HEAVY. I mean physically heavy, not just heavy in the stomach. It is a very English treat. If I am not mistaken this baked goodie is infused with rum and smothered in honey. Perfect to pair with black coffee. Also great to have as a late night snack. 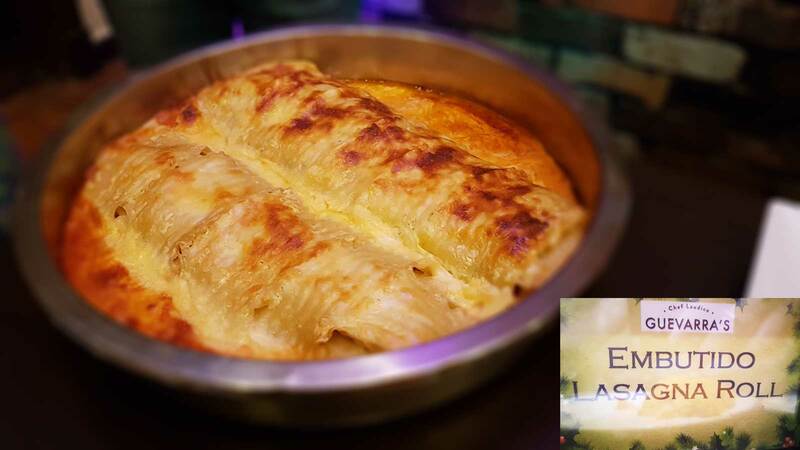 Suman is a traditional Filipino rice cake usually wrapped in a leaf and then steamed until cooked. We then eat it by dunking it in sugar. I personally like it paired with mango and topped with tablea chocolate. Guevarra’s combined the traditional suman with the a fruitcake by topping the suman with candied fruits. The end product is a sweet confection. Diabetics beware! As with the pudding this goes well with coffee. Bibingka is served in so many ways now — topped with cheese, egg, cheese and egg, filled with chocolate or any syrup. Seriously, the skies the limit! I personally like eating bibingka while drinking hot chocolate or coffee. Simbang Gabi is not complete without buying puto bumbong after hearing mass. But at Guevarra’s we don’t have to wait until December. We can have it now! Puto bumbong is served in single serve (big bite size) soup spoons. Not only is it delicious, it is also very beautifully presented it is almost a sin to eat! 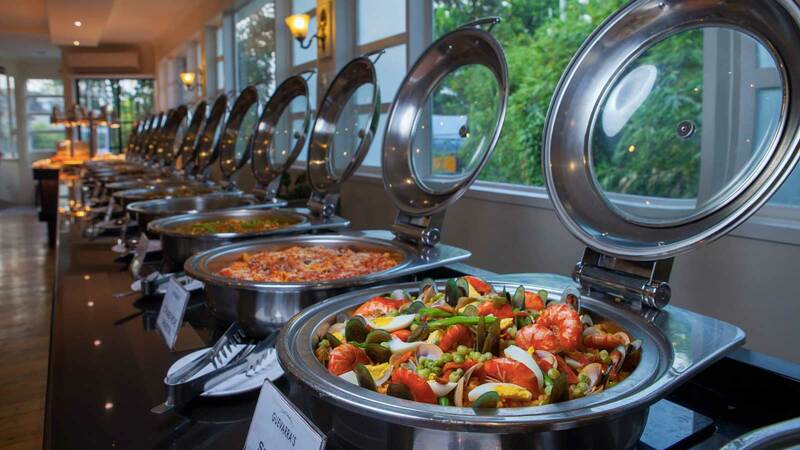 Should you go to Guevarra’s and sample their buffet? If I haven’t convinced you yet, I don’t know what will. Lol! But maybe you have a few more questions. Let me see if I can come up with some of the answers a they were given to us during the Q&A. Are there desserts made that are safe for diabetics? Chef Jac says they don’t have any at the moment but they’ve been discussing it and they intend to bring out dishes safe for diabetics soon. Those dishes will, of course, be specially labelled so that customers who suffer from it know that they could safely consume it. Is it necessary to call ahead for reservations? Yes, absolutely! Reservations are necessary. 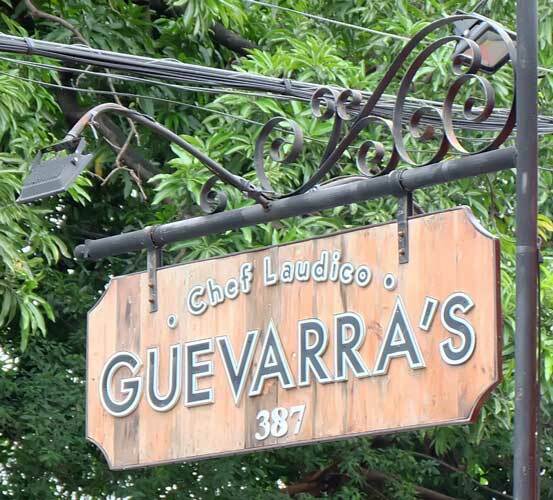 Guevarra’s does not like turning people away and the only way to ensure that is if reservations are made ahead of time. Like I mentioned, they don’t like turning people away. However, in the event that a party with no reservation arrives, they will be informed that they will have to wait in case someone who made a reservation (for the same number of people) fails to arrive within 30 minutes of their booking, then the walk-in party will be accommodated. What meals do they serve? No ala carte. It’s all buffet, buffet, buffet — lunch, “maagang salu-salo”, and dinner. Meals are prepared by world famous Chef Lau, it must be expensive. Meals are served at the timeframes below. Make sure to come early. Can we make reservations for private functions like company parties? Since they encourage reservations it is safe to say that customers will not be surprised to arrive to find the venue closed for private functions. Guevarra’s will just inform us whether or not the day and time we stated is available or not.